When ANNE WILLING BINGHAM and her husband returned to Philadelphia in 1786 they built a large house, a palatial mansion really, surrounded by gardens, to accommodate the extensive entertaining they planned. The city flourished when it became the capital of the United States. An English traveler, after a tour of the chief cities, remarked in 1794 that “Boston is the Bristol, New York the Liverpool, and Philadelphia the London of America.” The Binghams became the leaders of what was called the Republican Court. Mrs. Bingham has at last thought proper to show her painted face here, and her two daughters—they were without paint. You must not suppose from my manner of speaking about Mrs. B. that I am offended with her for not coming before. I should have been better pleased if she had, to tell the truth; but if she had not come at all I should not have cared; though she is of great consequence, in some people’s opinion, in the city. As she has put it in my power to go to her house, I shall certainly see all that I can by asking for. I am determined to see her garden, her greenhouse, and everything else that is worth seeing. Their house and all the outside look very pretty, and I daresay the inside corresponds with the external. Mrs. Stoddert was invited to a ball at the Binghams and wrote this detailed account to her sister. About half-past seven I called for Mrs. Harrison, and we made our appearance at Mrs. Bingham’s. . . . [S]he was seated at the head of the drawing-room, I should call it, or, in other words, on one side of the chimney, with three ladies only. There were some young ladies in another room, where her two daughters were also, who, upon my inquiring after their health, were sent for by their mamma. I should suppose that it was near nine o’clock before the dancing commenced. At the end of the first dance, or near it, punch and lemonade were brought in. That was the first refreshment. Sometime after, I think, it was brought in again, and soon after the best ice-cream, as well as the prettiest, that ever I saw was carried around in beautiful china cups and gilt spoons. The latter I had seen there before. Except punch and lemonade, nothing more to eat till supper, which we were summoned to at eleven, when the most superb thing of the kind which I ever saw was presented to our view,—though those who have been there before say that the supper was not as,elegant as they had seen there. In the middle was an orange-tree with ripe fruit; and where a common spectator might imagine the root was, it was covered with evergreens, some natural and some artificial flowers. Nothing scarcely appeared on the table without evergreens to decorate it. The girondole, which hangs immediately over the table, was let down just to reach the top of the tree. You can’t think how beautiful it looked. I imagine there were thirty at the table, besides a table full in another room, and I believe every soul said, “How pretty!” as soon as they were seated; all in my hearing, as with one consent, uttered the same thing. The only meats I saw or heard of were a turkey, fowls, pheasants, and tongues, the latter the best that ever I tasted, which was the only meat I ate. The dessert (all was on the table) consisted of everything that one could conceive of except jelly; though I daresay there was jelly, too, but to my mortification, I could not get any. I never ate better than at Mrs. Bingham’s. Plenty of blanc mange, and excellent. Near me were three different sorts of cake; I tasted all, but could eat of only one; the others were indifferent. Besides a quantity to eat, there was a vast deal for ornament, and some of them I thought would have delighted my little girl for her baby-house. In short, take it altogether, it was an agreeable entertainment to me. Notwithstanding the crowd—or numbers, rather, for the house is so large that it was not crowded—there was no noise or the least confusion. At twelve o’clock or a little after Mrs. Harrison and I left the ball. We were among the first to come away. Never did I see such a number of carriages, except on a race-ground. The Binghams had two daughters, the elder Anna Louisa, married the young Englishman Alexander Baring of the famous banking house in 1798. The younger daughter Maria Mathilda eloped, when she was fifteen, with the Comte de Tilly an older man of low character and without funds. The Binghams were distraught. Mr. Bingham secured a divorce for his daughter and the Comte left the country. Maria Mathilde then married the younger brother of her sister’s husband and some years later, after another divorce, married a French nobleman and moved to France. In 1799 the first child of the Barings was born; at the age of 35 Anne Willing Bingham had become a grandmother. She herself in the next year gave birth to a son. Anne’s health began to deteriorate and in 1801 her husband planned to take her to the island of Madeira where he hoped she would be returned to health. En route she died in Bermuda where she was buried. Margaret L. Brown, “Mr. and Mrs. William Bingham of Philadelphia: Rulers of the Republican Court”, The Pennsylvania Magazine of History and Biography, Vol. 61, No. 3 (July 1937), pp 207, 318, 319-321. Mrs. Stoddert was quoted in The Golden Voyage, Robert C. Alberts (pp 357-359). From Kate Mason Rowland, “Philadelphia A Century Ago,”Lipincott’s Monthly Magazine, Vol 62, 1898. In footnote 808, Jan 23, 1799; 805, 809-18. Literate upper class American women often occupied their time in the latter part of the eighteenth century in reading romantic novels. See previous post on this subject. 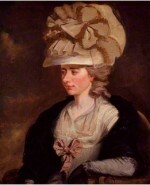 One popular novel making the rounds was Evelina by the Englishwoman Frances “Fanny” Burney. An epistolary novel, it tells the story of a young lady’s entrance into the world through a series of letters. In the original preface the author describes her purpose and method. To draw characters from nature, though not from life, and to mark the manners of the times, is the attempted plan of the following letters. 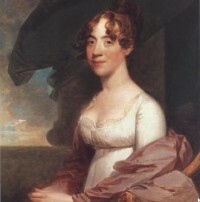 For this purpose, a young female, educated in the most secluded retirement, makes, at the age of seventeen, her first appearance upon the great and busy stage of life; with a virtuous mind, a cultivated understanding, and a feeling heart, her ignorance of the forms, and inexperience in the manners of the world, occasion all the little incidents which these volumes record, and which form the natural progression of the life of a young woman of obscure birth, but conspicuous beauty, for the first six months after her Entrance into the world. Burney goes on to defend her own and other novels that had become so popular with young women. Perhaps, were it possible to effect the total extirpation of novels, our young ladies in general, and boarding-school damsels in particular, might profit from their annihilation; but since the distemper they have spread seems incurable, since their contagion bids defiance to the medicine of advice or reprehension, and since they are found to baffle all the mental art of physic, save what is prescribed by the slow regimen of Time, and bitter diet of Experience; surely all attempts to contribute to the number of those which may be read, if not with advantage, at least without injury, ought rather to be encouraged than contemned. In the preface to The Journals and Letters of Francis Burney Burney describes what she tried to do (pages 2-3). Perhaps this may seem rather a bold attempt and title, for a female whose knowledge of the world is very confined, and whose inclinations, as well as situation, incline her to a private and domestic life. 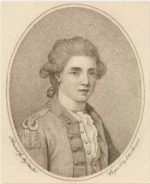 All I can urge is, that I have only presumed to trace the accidents and adventures to which a “young woman” is liable; I have not pretended to show the world what it actually is, but what it appears to a girl of seventeen; and so far as that, surely any girl who is past seventeen may safely do. Why not click on this link to Evelina and sample what so interested women readers of the time. Burney’s portrait ca. 1784-84 is at the National Portrait Gallery in London. Molly Tilghman of Maryland wrote to her cousin Polly Pearce in January of 1789 describing the hat of one of woman and the hair of another at a ball she attended. Other tidbits of gossip too. Wicked and amusing. Fain wou’d I dissect Miss [Anna] Garnett for your edification in the important point of fashion but a regular discription of so complicated a piece of work is more than I am equal to. Did you never of a rainy day, empty all your Drawers on the Bed, in order to set them to rights? If you can recollect the confus’d mixture of Ribbon, Gauze, flowers, Beads, Persian feathers and Lace, black and white, you will have the best idea I can give you of Miss Garnetts Hatt, such a Hoop and Handkerchief too was never seen on mortal Woman before. Upon my Life she was as complete a Carricature as any in our Hall. Mrs. Bordleys Head, without a Hat, was quite equal to the other. The tremendous majesty of her tete, will never leave my memory, which with the fabric which was erected on it made her almost as tall as myself. As her situation prevented her dancing I had a great deal of sweet converse with her. . . .
Can you imagine my dear Polly that I want to be reminded of my promis’d visit to Poplar Neck. Surely you know me better. If it depended on my inclination, soon wou’d you see me, but alas how few of our pursuits are directed by inclination. If I wanted an additional inducement to visit you, the alteration you tell me of wou’d be a great one. A succession of Beaux is pretty enough amusement in this dreary season and it wou’d be doubly agreeable to me from the powerful charm of novelty. If it were possible to exchange some of our Belles for some of your Beaux, the Circles of both wou’d be much improv’d by it. Could not your ingenuity contrive it ? On new years day Miss Nevitt was married to Mr Steele after a three years Courtship. Her reign has been brilliant, and she has clos’d it in very good time, while her train was undiminish’d. It is a nice point for a Belle to know when to marry, and one in which they are very apt. She understood the matter. The letter can be found in the Maryland Historical Magazine Vol. 21, No. 3, 234-35.